On this Martin Luther King Day, our Quote of the Week reminds us of Dr. King's power, which was rooted in his unwavering belief that all human beings, regardless of who they were, what they looked like, and where they came from, should be treated equally and deserved to live in peace. Dr. King's ability to turn that belief into action has mobilized people for generations. As we continue to combat racism, inequality, poverty, and violence as he did, we are grateful for his example. In his Graduate School Commencement Speech at the University of Maryland Baltimore County, Sargent Shriver made a fiery appeal to his audience. He told them, quite simply, to go out into the world and to build long-term peace. It was in this context that he challenged them to believe in their power to "bring justice to people in our country and in every corner of the world." To motivate them about the power of believing, he gave the example of Dr. King. We invite you to read Sargent Shriver's words from that day, which hopefully will inspire you on this day dedicated to Dr. King and to his legacy of service. "Dr. King’s Beloved Community is a global vision, in which all people can share in the wealth of the earth. In the Beloved Community, poverty, hunger and homelessness will not be tolerated because international standards of human decency will not allow it. Racism and all forms of discrimination, bigotry and prejudice will be replaced by an all-inclusive spirit of sisterhood and brotherhood. In the Beloved Community, international disputes will be resolved by peaceful conflict-resolution and reconciliation of adversaries, instead of military power. Love and trust will triumph over fear and hatred. Peace with justice will prevail over war and military conflict." 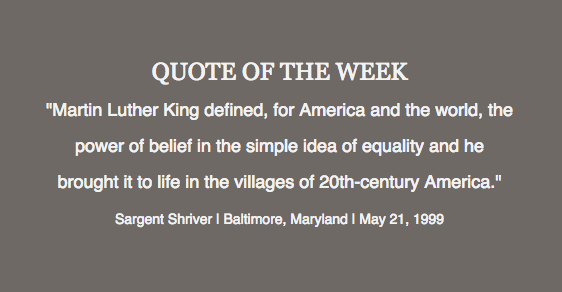 Dr. King's belief in the Beloved Community was one that Sargent Shriver shared, and it's one that we continue to work for. If this belief is one that resonates with you, we hope you find a meaningful way to put it into action on Dr. King's National Day of Service, and every day.